In recent years, The Great Game of Business’ transformative approach to business, rooted in opening the books, has been celebrated in The Wall Street Journal, Forbes Magazine®, and The New York Times; featured on MSNBC and PBS NewsHour; selected as one of the "100 Best Business Books of All Time" by 800-CEO-READ; and chosen as the "#1 Most Innovative Business Practice" by Inc. Magazine. Join this Great Game of Business community of 25+ year practitioners and top business coaches with proven results, resources, support, eLearning, training, events, and conferences. Our coaches will partner with you and your team to improve culture, have fun, reduce turnover, educate and empower employees, give your employees a purpose, improve morale and motivation, and increase employee performance to impact your organization’s bottom line and profit. When practicing The Great Game of Business (GGOB), the breakthrough comes when companies shift from focusing on an event (bonus plan, financial literacy program, etc.) to using GGOB as a business operating system to run their organization. GGOB is a system, a pattern, a strategy, a way of thinking. If you want to fully leverage the power of The Game, you must treat it as a system and persistently work it. The purpose of our business coaching services is to help your team learn, implement, and sustain the GGOB system. Our promise is rapid financial results and lasting cultural change. 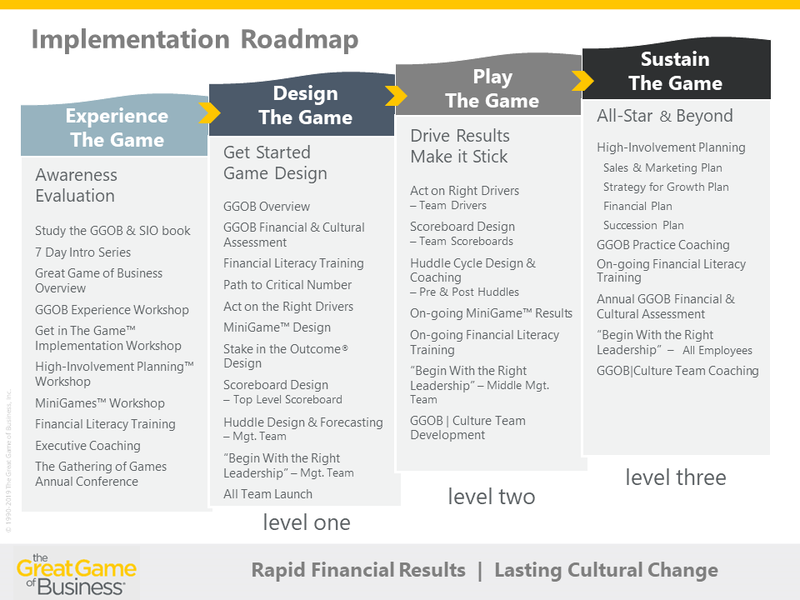 Our executive business coaching support begins with Level One: Getting Started | Design The Game. The objective of Level One is to help your team not only learn how the game of business is played, but also apply your learning through the design of your own Game. Although specific on-site dates and times will be determined, the process will take approximately 90 days, including 3–4 days on-site and weekly business coaching conference calls. Included in a coaching agreement will be Financial Literacy Assessment & Training for your management/design team. The management/design team will be the team your high-performance business coach works with to design your company's Game. The training that is selected will be based on your industry and company structure.